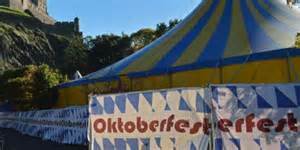 If you cannot visit Germany this October for the Beer Festivals then don't be disheartened there are plenty of Oktoberfests' to be enjoyed in the UK. Here are a few:-. Albert Square is hosting a five day extravaganza for 2,000 people. If you want to look the part, you can rent lederhosen and dirndls for £29 and there’s a souvenir shop for when you decide that a nice green Trenker hat would look super stylish after stein number four. Surely the best place to enjoy the Munich staple is in its twin town of Edinburgh? And where better in Edinburgh to enjoy a feast of Germanness than in Princes Street Gardens. Spread over a long weekend, they promise to have you up on those benches and singing along in no time. If you want a head start, the website offers you a preview of the song list for helpful hints. Be sure to learn the dance moves to the Fliegerlied song. You’ll need them. 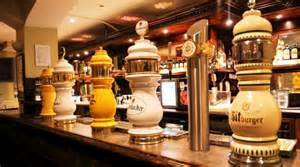 The Original Beerhouse was founded in 2005 and now boasts sister restaurants in Tower Hill and Bristol. The Beerhall seats 130 people and with an additional indoor “Biergarten”, there’s sure to be a great crowd. 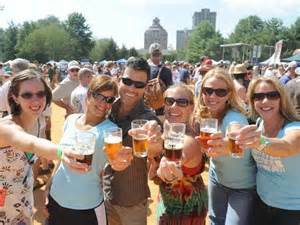 And if you miss out on Oktoberfest this year, it’s not the wurst! 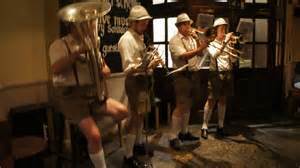 The Bavarian Beerhouse celebrates all year round every Thursday, Friday and Saturday. Closed on Sundays in typical German spirit. Bristol dates: 30th September - 17th October 2015. Bierschenke brings a touch of Munich to the proceedings. The “bierkeller” is split over two levels with a smaller, cosier ‘Kneipe’ upstairs and a large beer hall that sits over 300 people in the sub-basement. Not only do they serve traditional German meats and sausages, but also have three exclusive beers specially brewed for them by Müllerbräu, based outside Munich. Looking for something a bit different to an indoor beer hall? This year, Birmingham Oktoberfest is holding its celebrations in a tent that fits 2,500 people. 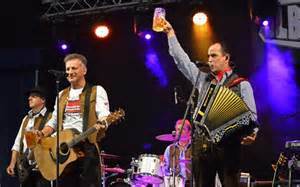 Bavarian Bands are flown in to get you dancing on the tables (and you will, trust me) and singing along to classic German hits (as cheesy as it sounds). Entry is free on day one, and Sunday is family day, serving traditional Bavarian sausage for lunch. 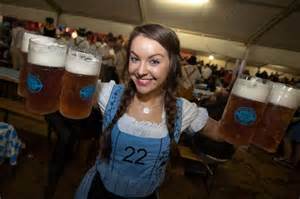 The Tobacco Dock in Wapping is hosting Oktoberfest for the first time from 8th-11th October. Featuring no less than six different beer tents to rove around in, authentic Oompah bands and food provided by breakout chain Herman Ze German, it’s great value for £10 admission. Buy a £60 ‘Paulaner Pass’ and you’ll get unlimited steins of beer and priority seating. Tickets are selling out quickly, so act fast! Oktoberfest at Chapter is not limiting itself to Bavaria. Starting from 14th October, the Cardiff festival is celebrating all the beers Germany has to offer, including Oktoberfest-staples from Bavaria, but also adding a touch of Kölsch (from Cologne) and Schwarzbier (Saxony). Free entry for all four days. Last year’s event proved to be so popular, it is returning to Kings Hall again for eight more days across four weeks. Serving several Paulaner beers brewed in Munich, the event also offers Bratwurst to soak up all that weissbier (and curry ketchup to transform it into the beloved Currywurst).